Falling gasoline prices and a strengthening economy should result in a record number of motorists hitting the road for the Independence Day holiday. A total of 44.2 million Americans are expected to travel 50 miles or more away from home, either driving, flying, or taking to the rails and waterways, according to AAA. That would surpass last year's total by 1.25 million. It helps that the holiday period covers more days, from June 30 to July 4. "Combined, strong employment, rising incomes and higher consumer confidence bode well for the travel industry, in particular this Independence Day weekend," said Bill Sutherland, a senior vice president at AAA. 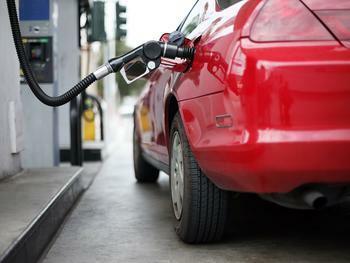 Cheaper gasoline prices may be a big driver. The price of a fill-up is cheaper than it was at this time last year, when prices were also very low. The AAA Fuel Gauge Survey shows the national average price of self-serve regular is $2.28 a gallon, four cents less than a year ago. The average price of premium gas is $2.82 a gallon, about the same as last year. The average price of diesel is $2.46 a gallon, six cents more than last year. Most of the people traveling over the holiday will be driving. AAA projects 37.5 of the 44 million people on the move will be on the highways, a nearly 3% increase over last year. Other ways of travel, including trains, buses, and cruise ships, are expected to increase nearly one and a half percent, to 3.27 million travelers. AAA also reports that airfares and rental car rates are less this year. AAA's Leisure Travel Index shows average airfares for the top 40 domestic flight routes will be 10% less this year over last, with an average round trip ticket around $186. Meanwhile, the average daily rate for a rental car is estimated to be $65, a 14% drop from last year. A hotel stay should average about the same as last year. The average AAA Three Diamond Rated hotel should cost around $185 per night.